Wear a face mask to prevent breathing in dust. Cover all heating and air ducts to prevent dust from entering into your system. 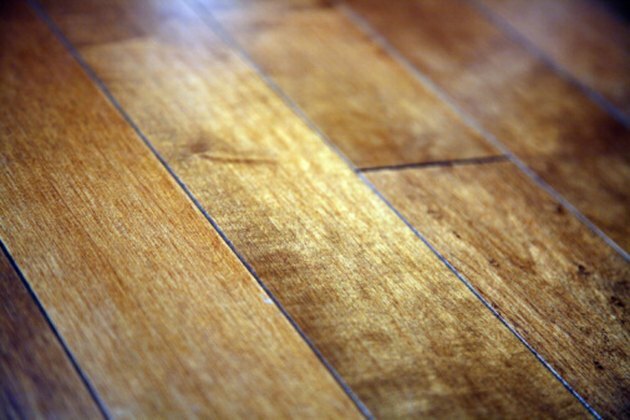 Sanding is not the only method when refinishing hardwood floors to restore shine. Over time, hardwood floors can appear worn and dull and can make your entire room look shabby. Sanding is a common method used when refinishing floors, but it can cause excessive dust that lingers on furniture and other items throughout the home. There are alternative methods used when refinishing floors that also are easier. They are generally used on floors with less wear. Remove everything from the room and sweep or vacuum the hardwood floor to remove any dirt or debris. Scrape off anything stuck to the floor, such as gum. Attach a medium- or fine-grit mesh screen to your buffer. Use a fine-grit screen on floors with light wear and a medium-grit screen on those with more damage. Place the buffer at the end of the room farthest from the door. Turn the buffer on and run it in a straight line in the direction of the wood grain, moving toward the door. Remove the mesh and flip it over as needed. Remove the screen and fold in half to manually buff areas, in corners and against the walls, where the buffer cannot reach. Vacuum the floor. Remove any remaining dust with a lint-free cloth or pad soaked with mineral spirits. Apply a layer of varnish or clear coat using a paintbrush or paint roller, starting again at the farthest end of the room and working your way toward the door. Allow the hardwood floor to completely dry before bringing the furniture back into the room. Repeat steps for remaining hardwood floors. Remove everything from the room and sweep or vacuum the hardwood floor to remove any dirt or debris. Open all windows and doors. Apply an even coat of chemical stain stripper to the hardwood floor using a paintbrush or paint roller, starting at the farthest end of the room and working your way toward the door. Allow the chemicals to sit on the floor for at least two to three hours. Scrape the floors gently with a scraper to remove all of the old finish from the floors. Move in the direction of the wood grain to prevent damage. Allow the floor to dry overnight before reapplying varnish or stain. Apply the varnish or stain evenly using a paintbrush. Apply two coats for best results. Allow the hardwood floor to completely dry before bringing the furniture back into the room.